Available in either a Black or Silver finish, this banner stand expands from 36" to 96" high and 48" to 117" wide. Includes carrying case. 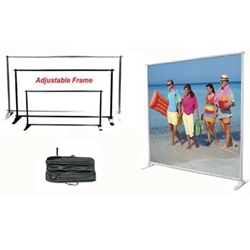 The Versatile Display System adapts as your needs change! The banner systems telescope in height and width to create great looking display quickly and easily. Can be used as a full size backwall. Available in Black and Silver Finish.